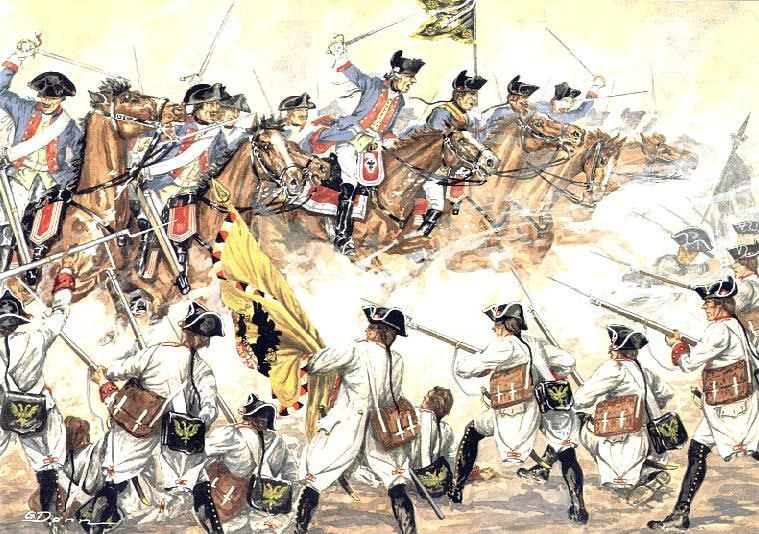 Battle of Hohenfriedberg, Attack of the Prussian Infantry , by Carl Röchling. Oil on canvas. HOHENFRIEDBERG, or HOHENFRIEDEBERG The battle gets its name from a village in Silesia about 6 miles from the small town of Striegau in the War of the Austrian Succession, the battle was fought on the 3rd of June 1745 between the Prussians under Frederick the Great and the Austrians and Saxons commanded by Prince Charles of Lorraine . In May the king, whose army had occupied extended winter quarters in Silesia, had drawn it together into a position about Neisse whence he could manoeuvre against the Austrians, whether they invaded Silesia by Troppau or Glatz, or joined their allies who, under the duke of Weissenfels, were on the upper Elbe, and made their advance on Schweidnitz, Breslau or possibly Liegnitz. Knowing that the Austrians were concentrating towards the Elbe, Frederick gradually drew his army north-westward along the edge of the mountain country until on the 1st of June it was near Schweidnitz . At that date the Austro-Saxons were advancing (very slowly owing to the poorness of the roads and their artillery train) from Waldenburg this promptly retired in order to avoid being surrounded. Dumoulin then posted artillery on the slope of the hill and deployed his six grenadier battalions facing the village. The leading cavalry of the main army came up and deployed on Dumoulin’s left front in open rolling ground. Meantime the duke of Weissenfels had improvised a line of defence, posting his infantry in the marshy ground and about Pilgramshain, and his cavalry, partly in front of Pilgramshain and partly on the intervening space, opposite that of the Prussians. But before the marshy ground was effectively occupied by the duke’s infantry, his cavalry had been first shaken by the fire of Dumoulin’s guns on the Spitzberg and a heavy battery that was brought up on to the Grahener Fuchsberg, and then charged by the Prussian right-wing cavalry, and in the melee the Allies were gradually driven in confusion off the battlefield. The cavalry battle was ended by 6.30 A.M., by which time Dumoulin’s grenadiers, stiffened by the line regiment Anhalt (the ” Old Dessauer’s ” own), were vigorously attacking the garden hedges and walls of Pilgramshain, and the Saxon and Austrian infantry in the marsh was being attacked by Prince Dietrich of Dessau with the right wing of the king’s infantry . The line infantry of those days, however, did not work easily in bad ground, and the Saxons were steady and well drilled. After an hour’s fight, well supported by the guns and continually reinforced as the rest of the army closed up, the prince expelled the enemy from the marsh, while Dumoulin drove the light troops out of Pilgramshain. By 7 AM the Saxons, forming the left wing of the allied army, were in full retreat. While his allies were being defeated, Prince Charles of Lorraine had done nothing, believing that the cannonade was merely an outpost affair for the possession of the Spitzberg. His generals indeed had drawn out their respective commands in order of battle, the infantry south of Gunthersdorf, the cavalry near Thomaswaldau, but they had no authority to advance without orders, and stood inactive while the Prussian columns were defiling over the Striegau Water. This phase of the king’s advance was the most delicate of all, and the moment that he heard from Prince Dietrich that the marsh was captured he stopped the northward flow of his battalions and swung them westward, the left wing cavalry having to cover their deployment. But when one-third of this cavalry only had crossed at Teichau the bridge broke. For a time the advanced squadrons were in great danger. But they charged boldly, and a disjointed cavalry battle began, during which (Ziethen’s hussars having dis- covered a ford) the rest of the left-wing cavalry was able to cross. At last 25 intact squadrons under Lieut.-General von Nassau charged and drove the Austrians in disorder towards Hohenfriedberg. This action was the more creditable to the victors in that 45 squadrons in 3 separate fractions defeated a mass of 6o squadrons that stood already deployed to meet them. Meanwhile the Prussian infantry columns of the centre and left had crossed Striegau Water and deployed to their left, and by 8.30 they were advancing on Gunthersdorf and the Austrian infantry south of that place. Frederick’s purpose was to roll up the enemy from their inner flank, and while Prince Dietrich, with most of the troops that had forced the Saxons out of the marsh, pursued Weissenfels, two regiments of his and one of Dumoulin’s were brought over to the left wing and sent against the north side of Gunthersdorf. In the course of the general forward movement, which was made in what was for those days a very irregular line, a wide gap opened up between the centre and left, behind which were squadrons of the Bayreuth dragoon regiment, with Lieut.-General von Gessler, took up their position. Thus the line advanced. The grenadiers on the extreme left cleared Thomaswaldau, and their fire galled the Austrian squadrons engaged in the cavalry battle to the south. Then Gunthersdorf, attacked on three sides, was also evacuated by the enemy. But although Frederick rode back from the front saying “the battle is won,” the Prussian infantry, in spite and Landshut through the mountains, heading for Striegau. After a few minor skirmishes at the end of May, Frederick had made up his mind to offer no opposition to the passage of the Allies, but to fall upon them as they emerged, and the Prussian army was therefore kept concentrated out of sight, while only selected officers and patrols watched the debouches of the mountains . On the other hand the Allies had no intention of delivering battle, but meant only, on emerging from the mountains, to take up a suitable camping position, and thence to interpose between Breslau and the king, believing that ” the king was at his wits’ end, and, once the army really began its retreat on Breslau, there would be frightful consternation in its ranks.” But in fact, as even the coolest observers noticed, the Prussian army was in excellent spirits and eager for the “decisive affair“ promised by the king. On the 3rd of June, watched by the invisible patrols, the Austrians and Saxons emerged from the hills at Hohenfriedberg with bands playing and colours flying. Their advanced guard of infantry and cavalry spread out into the plain, making for a line of hills spreading north-west from Striegau, where the army was to HOHENFRIEDBERG. But the main body moved slowly, and at last Prince Charles and Weissenfels decided to put off the occupation of the line of hills until the next morning. The army bivouacked therefore in two separate wings, the Saxons (with a few Austrian regiments) between Gunthersdorf and Pilgramshain, the Austrians near Hausdorf. They were about 70000 strong, Frederick 65000. The king had made his arrangements in good time, aided by the enemy’s slowness, and in the evening he issued simple orders to move. About 9 P.M. the Prussians marched off from Alt-Jauernigk towards Striegau, the guns on the road, the infantry and cavalry, in long open columns of companies and squadrons, over the fields on either side—a night march well remembered by contrast with others as having been executed in perfect order. Meanwhile General Dumoulin, who commanded an advanced detachment between Striegau and Stanowitz, broke camp silently and moved into position below the hill north-west of Striegau, which was found to be occupied by Saxon light infantry outposts . The king’s orders were for Dumoulin and the right wing of the main army to deploy and advance towards Haslicht against the Saxons, and for the left wing infantry to prolong the line from the marsh to Gunthersdorf, covered by the left-wing cavalry on the plain near Thomaswaldau. On the side of the Austrians, the outlying hussars are said to have noticed and reported the king’s movement, for the night was clear and starlit, but their report, if made, was ignored. 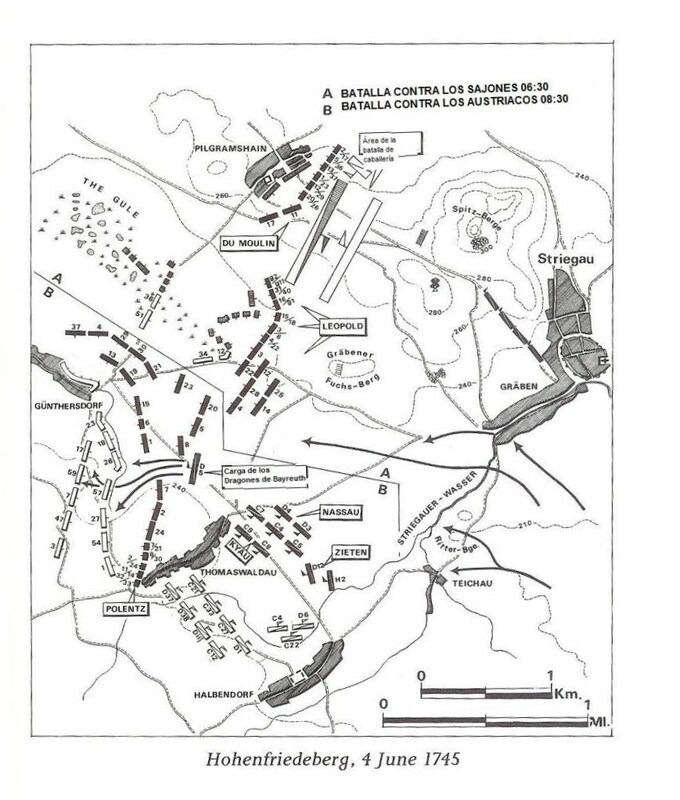 At 4 A.M. Dumoulin advanced on Pilgramshain, neglecting the fire of the Saxon outpost on the Spitzberg, whereupon of its superior fire discipline, failed for some time to master the defence, and suffered heavily from the eight close-range volleys they received, one or two regiments losing 40 and 50 % of their strength. The Austrians, however, suffered still more; feeling themselves isolated in the midst of the victorious enemy, they began to waver, and at the psychological moment Gessler and the Bayreuth dragoons charged into their ranks and “broke the equilibrium.” These 1500 sabres scattered twenty battalions of the enemy and brought in 2500 prisoners and 66 Austrian colours, and in this astounding charge they themselves lost no more than 94 men. By nine o’clock the battle was over, and the wrecks of the Austro-Saxon army were retreating to the mountains. The Prussians, who had been marching all night, were too far spent to pursue. The loss of the allies was in all 15224, 7985 killed and wounded, and 7239 prisoners, as well as 72 guns and 83 standards and colours. The Prussians lost 4666 killed and wounded, 71 missing.